Ever wonder what's going on at the soil surface? Without a clear view of the surface landscape, growers may be unaware of damaging irrigation or soil problems that ultimately will impact long-term production. Soil zone index is a product map that can see through vegetation to focus strictly on soil surface. Soil zone maps give growers a ground-level view of their crops' foundation with each image that's collected. 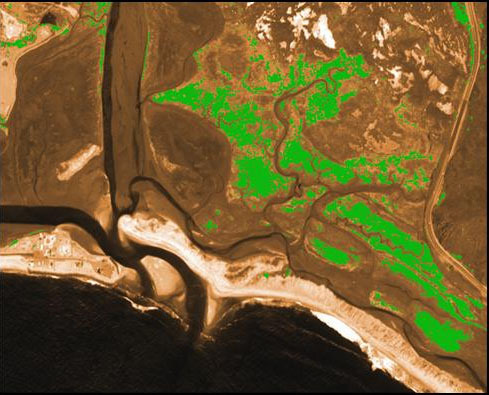 To develop a soil zone map, satellite images of your land are calibrated and then spectral algorithms are applied that isolate soil components from vegetation. The final satellite image shows what the soil surface of your field looks like, including irrigation patterns, sand streaks, clay lenses, and organic matter and crop residue variations. If the crop has less than 50 percent canopy cover, With a soil zone map, you can clearly see landscape variations. Lighter colors indicate dry, salty or coarsely textured soils, while darker colors indicate wet or organic soils. Often, variations in color indicate topographic variations across fields, which can greatly impact your crop management strategies and zone creation for precision agriculture management applications. This information will help you adjust irrigation practices, determine where to take soil samples or place moisture sensors, and understand drainage or tiling problems. Additionally, because surface patterns can change during the growing season due to rainfall, tillage or irrigation, these maps can be provided each time an image is collected. This gives you the most up-to-date data to determine how your crop is actually growing and provides more than one image to select from when making management decisions once the crop has been harvested. By focusing on improving soil management during and after the growing season, growers can increase vegetation health and harvests. Because these maps highlight soil patterns, you can alter existing irrigation, fertility and production practices, making the most of the current season. Moreover, the maps are effective tools for determining where to sample soils and how to draw next season's crop-management zones. The soil zone information layer can be used in a desktop GIS or on-line tools offered through Satellite Imaging Corporation to generate sampling points or Variable Rate Application (VRA) maps.